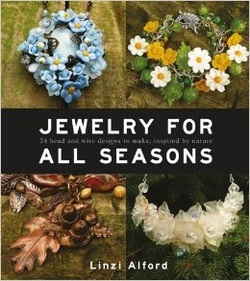 My book - Jewelry For All Seasons was published on February 26th 2014 -YAY! Signed or dedicated copies will be available from me directly- contact me for details . Book is due for release on Nov 4th 2014 in USA, but many UK sellers will ship now. Here is a link to the book reviews on Amazon UK http://www.amazon.co.uk/product-reviews/1861089562 and below is a review and feature in Creative Life Magazine March 2014. If you need more to whet your appetite, you can view the book preview slideshow on Youtube here (opens in a separate window) with some of the projects and inspirational photos.